The parades, with floats and elaborate costumes that have taken months to prepare, are a wonderful spectacle. Carnival is synonymous with festivity, fun and letting your hair down. In Girona we celebrate it by taking to the streets in fancy dress costumes, moving to the rhythm of the music. 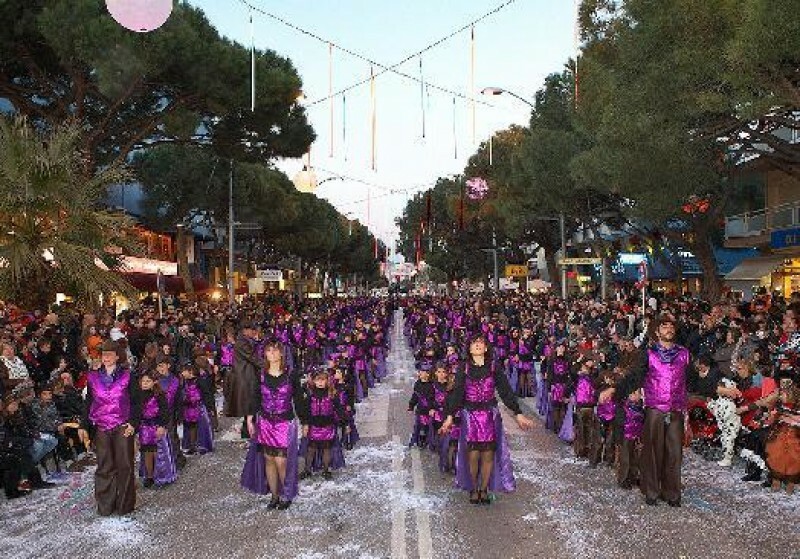 In many towns on the Costa Brava, and further inland, the Rei Carnestoltes (Carnival King) gets the festivities under way with a speech in which he urges everyone to have fun for a few days. You're invited as well, of course. The parades, with floats and elaborate costumes that have taken months to prepare, are a wonderful spectacle. Apart from the festivities and fancy dress costumes, this celebration is also closely associated with gastronomic culture. According to tradition, Carnival begins on the last Thursday before Lent, Dijous Gras (literally, “Fat Thursday”), a day on which omelette and botifarra (Catalan sausage) or egg botifarra is eaten. Traditionally, neighbours would organise feasts in the street before the fasting of Lent began. These collective feasts are still organised in some towns today as part of the festivities. In Vidreres and Capmany, for example, they celebrate by eating the Ranxo together, a kind of meat stew with all sorts of ingredients. In Agullana, the feast of the Xuia takes place, involving a parade around the town to collect the ingredients to prepare the traditional botifarra and bacon omelettes (xuies), which the townsfolk then eat as an afternoon snack. Another great community experience is sharing a table at the Rice Feast of Albons and the Soup of Verges, rather like the traditional meals offered by feudal lords to the poor. The days of wild Carnival celebrations are brought to an end with the burial of the sardine, bringing to an end the excesses of the preceding days. In many towns they say farewell to the Rei Carnestoltes (Carnival King) in a rather peculiar way, by burning the figure on a bonfire. As he burns, his final will and testament (a satirical criticism of society) is read out as the last hurrah of a festival that will fortunately be back again next year.